“Tout en Français!” the posters proclaim, and indeed Stripped – Eddie Izzard’s whistlestop tour through the history of civilisation, which he has performed on and off in English since 2008 – sees him hold forth on evolution, Nazis, sharks, God being a crack addict and giraffes playing charades – all in French. His command of the language is excellent: he’s fluent enough to hop, skip and tumble from one surreal topic to another just as he does in his native tongue. In fact, he uses barely a word of English, just the occasional bit of swearing for effect; if he can’t quite remember the conjugation of a verb he will ask the audience: (“Comment dit-on ‘éteindre’ au passé composé?” – “What’s ‘to extinguish’ in the past tense?”) and they are delighted to help out. 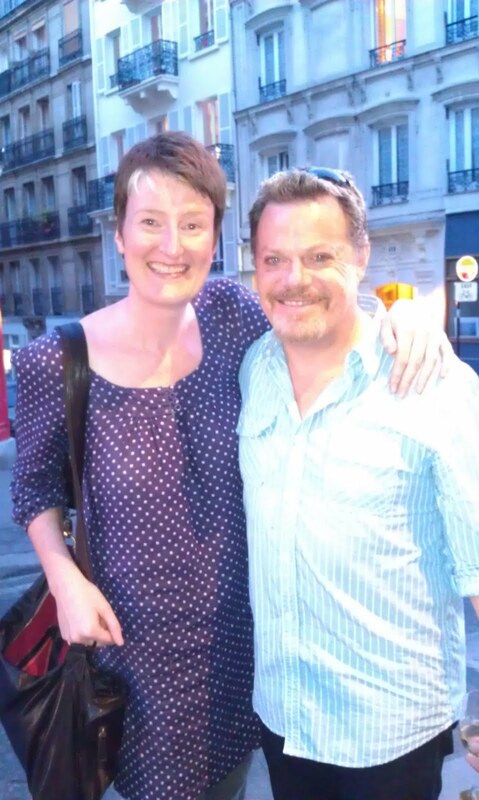 Although venerated by French comedians, Izzard is by no means a household name. He has played in Paris twice before, but the last time was 11 years ago. The title Stripped is apposite: the venue is a small, boiling-hot 135-seater in the heart of Pigalle, home to the Moulin Rouge and many a saucy cinema. (His next gig, incidentally, is the Hollywood Bowl, capacity 17,000.) After an initial flurry of bilingual expats, the vast majority of the audience now is French and they take to him right from his opening “Bonsoir!” The show is classic Izzard – universal themes illustrated in surreal detail: dinosaurs singing hymns, opera singers omitting consonants; a literary giant squid running out of ink. If anything flags slightly, he stops and makes his trademark notes on his hand: “Non. C’est drôle, mais peut-être pas pour lundi.” (“It’s funny, but maybe not for a Monday.”) There are passing topical references to Dominique Strauss-Kahn and Marine Le Pen, but bigger laughs come when he references George Formby and tries to explain his most famous song “Quand Je Nettoie Les Fenêtres”; or Kenneth Williams, whom he compares to a velociraptor opening a door. (I found out afterwards that he had improvised that scene and was so pleased with how it went down, he’ll now use it in English.) Izzard’s linguistic dexterity is particularly evident in a satisfying climax involving two soldiers trying to discuss Hannibal, but getting horribly entangled in Latin declensions and verb endings. Amo, amas, amat. We all loved it. Eddie Izzard “STRIPPED ON THE SHORE” at Shoreline Amphitheatre on Saturday July 16th. As one of 2 outdoor performances in the US this summer, you don’t want to miss your chance to see what The New York Times calls, “The most brilliant stand-up comedian of his generation”, at one of California’s most legendary venues. Funnyman Eddie Izzard has vowed to pursue a career in politics by standing as a candidate for the position of London Mayor in 2020. The comedian is a vocal supporter of Britain’s Labour party and campaigned on former leader Gordon Brown’s behalf in the run-up to the U.K.’s general election last year (10). He has now confirmed he will put himself forward to run London as a Member of Parliament (MP) or a Member of the European Parliament (Mep) in the 2020 ballot. Eddie Izzard makes Hollywood Bowl History with Stripped to the Bowl, the first-ever solo standup comedy show at the iconic venue. The Hollywood Bowl box office opens for single ticket sales on Saturday, May 7, 2011. For more information please call 323.850.2000. COMEDY met politics in Leeds when Eddie Izzard dropped in on students and shoppers in the city yesterday. The cross-dressing comic was in no joking mood when he visited students at Leeds Metropolitan University’s City Campus Library, in Woodhouse. His appearance also drew the crowds in Briggate, where he expressed his support for the Yes to Fairer Votes campaign, with the help of student musicians from Leeds College of Music. The stand-up comedian and actor, 49, is a leading voice behind the campaign, which backs people to vote for the alternative vote system. His visit to Leeds came as part of a whirlwind UK tour to back the change, in which he is travelling around the country in a purple Volkswagen camper van. Eddie Izzard breezed into Cambridge to push the boat out for pro-Alternative Vote crusaders. The comedian and writer, a staunch supporter of the YES! To Fairer Votes campaign, donned rowing gear and joined college crews on the River Cam to help local supporters get their AV message across. The Cambridge branch of the Yes campaign has used boat racing as a motif in the run-up to tomorrow’s Alternative Vote referendum. The referendum asks voters to say whether they want the existing first-past-the-post system for parliamentary elections to be replaced by AV, which allows people to rank candidates in order of preference. Mr Izzard arrived at the Trinity Hall boathouse last night to meet campaign supporters and members of boat crews from Clare College and St Edmund’s College. He posed for the cameras on a riverside rowing machine and then joined the crews on the river, ahead of tomorrow’s referendum. COMEDIAN Eddie Izzard rode into Oxford yesterday in an attempt to ignite interest in voting reform. Tomorrow voters will have their say on whether the UK should replace the first past the post election system with the alternative vote (AV). “Vote no” campaigners are adamant people should back the status quo. And many advocates of change fear the nation has switched off from the issue altogether. But Mr Izzard took to the streets to enthusiastically urge people to vote yes to AV. As previously reported in the Oxford Mail, analysis of the last year’s General Election, carried out by academics at Essex University, showed the Liberal Democrats would have won both Oxford seats if AV had been used. Mr Izzard, who was paraded through the city on the back of a cycle rickshaw, said AV was a fairer system and, contrary to some opinion, was not complicated.